Small in stature, open this beautiful Caledonia Jewelry Chest to reveal more storage that you'll ever need for you most valuable items. At first glance, you'll notice a clean, Shaker design that is easy to incorporate into any decor. The large top, clean flush-mounted drawers, and simple curved doors all provide subtle details that are sure to make a statement. 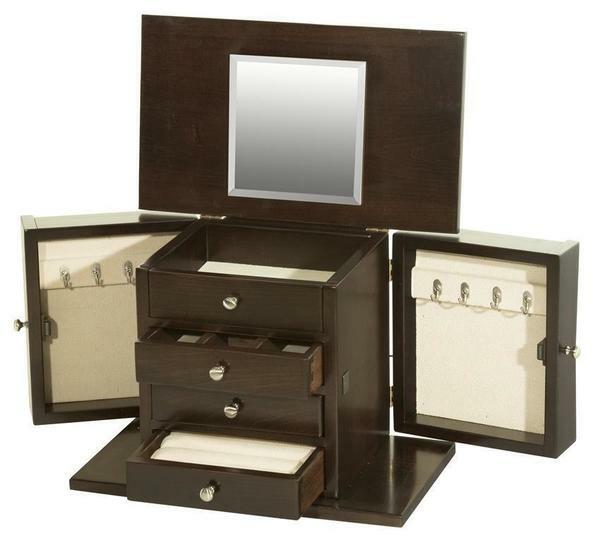 The large top flips up easily to reveal the first hidden feature of this chest - a large mirror and felt lined storage provide space for your must-have items, while ensuring you look great when getting ready for the day. Below, three more drawers provide organized storage space for rings, bracelets, and any other piece you want to have handy. On each side, doors open to reveal four hooks for hanging necklaces and bracelets to keep them free from tangling and knotting together over time. Customize this piece for you or as a memorable gift for someone special. Available in four different hardwoods, each with a unique stain to emphasize the natural grain patterns of the piece, you're sure to find the perfect combination to fit any space. If you don't, we can always provide a free custom stain quote if you had something different in mind. Just call one of our Furniture Specialists today to answer your questions, provide a free quote, and help you place your order by phone. 20.5" x 11" x 18"